President Trump listens during a meeting with inner city pastors at the White House on Aug. 1. After all, there's a distinct pattern in the administration. The president makes a claim that seems to contradict longstanding policy. Shortly thereafter, a Cabinet member or two will step up to a microphone and reiterate U.S. policy, contradicting the president. The most recent example are new sanctions the Trump administration plans to level against Russia for using a nerve agent in the attempted assassination of a former Russian agent in the United Kingdom. Shortly after the British government declared in March that Russia was behind the chemical weapons use, Trump sowed doubt on the findings. "As soon as we get the facts straight, if we agree with them, we will condemn Russia or whoever it may be," said Trump in March of conclusions drawn by the intelligence agencies of the United States' closest ally. The administration quickly put out a stronger statement in Trump's name and this week's sanctions show that it's another of many disconnects between what the president has said (or tweets) and what his top officials and Cabinet secretaries do. 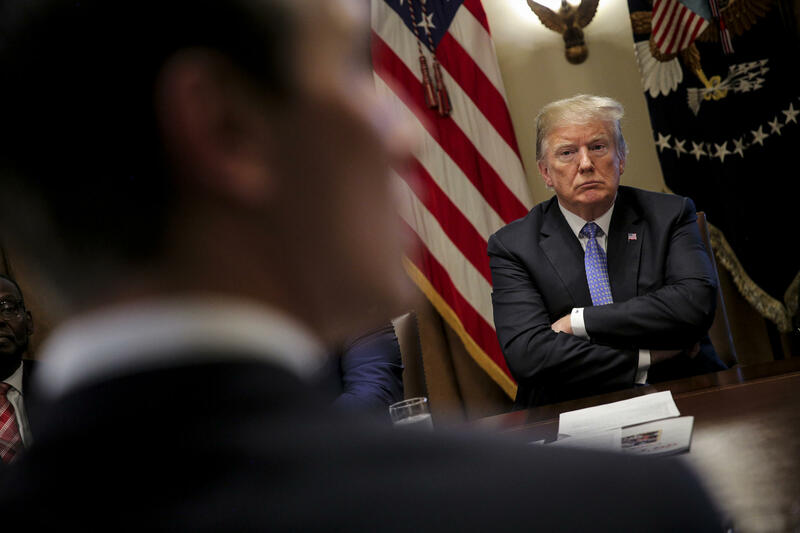 Elaine Kamarck, a senior fellow at the Brookings Institution and a lecturer in public policy at the Harvard Kennedy School, says this dynamic is unusual for a president. "Almost all presidents plan what they're going to say and plan how to have the government behind them when they go to implement what they say," she says. For the Trump administration, that formula is turned on its head. There was the time Trump said he'd forgive Puerto Rico's debt. His budget director stepped in and said, no, in fact, that wasn't going to happen. There was the time when Trump went to the NATO headquarters and refused to say the U.S. was committed to NATO's mutual defense pact. His defense secretary and vice president rushed out to say, in effect, the president's words, or the absence of them, was not the official U.S. policy toward NATO. Last week, the president continued his rhetoric on the special counsel's "witch hunt" and wrote what seemed like a request to his attorney general on Twitter. Quickly, his administration sought to clarify that the president wasn't issuing any commands — just his opinion. One of Trump's top lawyers, Rudy Giuliani, said the president has established a clear practice that he expresses his opinions on Twitter. "He used the word 'should.' He didn't use the word 'must.' And there was no presidential directive that followed it," Giuliani said. "He didn't direct him to do it and he's not going to direct him to do it." Press secretary Sarah Sanders echoed that sentiment during a briefing. "It's not an order," she reiterated. "It's the president's opinion." That opinion, which the president repeatedly expresses, is that the Mueller probe is a rigged witch hunt, something that top administration officials, including the president's FBI director, Christopher Wray, deny. Kamarck says Donald Trump increasingly operates as a party of one, untethered from his own administration. "This president simply seems to wake up in the morning and say things with nothing behind them, no preparation, no theory of the case, and no coherency," she says. "And it's causing a lot of confusion in his White House because they're always scrambling after him." Sometimes, that scrambling ties Cabinet secretaries in knots. Take Iran, for example. During a press conference with the Italian prime minister, President Trump said he would be willing to meet with the leaders of Iran without any preconditions. "No preconditions, no," he said in response to a reporter's question. "If they wanna meet, I'll meet." Hours later on CNBC, Secretary of State Mike Pompeo seemed to backtrack that idea, sharing a long list of preconditions that Iran would have to meet before sitting down with the president — like reducing its malign behavior and agreeing that it's worthwhile to enter into a nuclear agreement that prevents proliferation. The difference between what the president says and the policy of the United States is yet another question that tripped up the secretary of state during a Senate hearing on July 25. Sen. Chris Murphy, D-Conn., questioned Pompeo about U.S. policy versus a statement from the president regarding Russian interference in the 2016 election. "I make lots of statements. They're not U.S. policy. The president says things, right?" Pompeo said. "The president makes comments in certain places. We have we have a National Security Council. We meet, we lay out strategies, we develop policies, right?" Later on in the hearing, Pompeo asked for a redo on how to decipher policy from presidential messaging. "I misspoke. It is the case that the president calls the ball," he said. "His statements are in fact policy." Kamarck says these kind of back and forths between the administration and the president cause "confusion internationally among our allies [and] some glee among our adversaries." She says it also causes confusion for leaders in Trump's own party. "Just the other day, he said he was going to shut down the government because they they haven't appropriated money for the wall," she says. "It took hours, if not minutes, for Mitch McConnell to say, no we're not shutting down the government." But on some level, she says, what the president of the United States says or doesn't say really might not matter. "What's important to remember is we have never been a government of men. We are a government of laws," she says. "So the laws of the land, the treaties that we have signed to, that's what is operative for the United States government, not what any president may say one morning." Barbara Sprunt contributed to this report.